Part 1 of this series will focus on the meetings themselves, held on April 12th 2012. 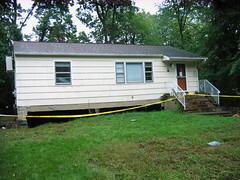 On April 12th 2012, in Lincoln Park, NJ, the New Jersey Department of Environmental Protection presented a report based upon 6 months of studies to the governments of Pequannock, Lincoln Park, Little Falls, Wayne, Pompton Lakes, Paterson, and other flood affected communtiies. The meeting was administered by NJ DEP head Bob Martin and his staff and was followed immediately after by a meeting for the general public, focusing on the progress made through the 15 Point Flood Plan. 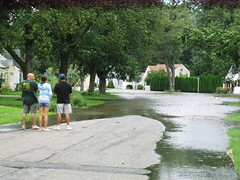 Following the events of Hurricane Irene and the resultant flooding in August of 2011, this study was commissioned to address the concerns of local townships over the possibility that the Pompton Lakes Floodgates were contributing to downstream flooding. The floodgates were installed and fully automated under a project by the Army Corps of Engineers in 2007, to address flooding created by the Pompton Lakes Dam's backwater in Oakland, NJ. Since that time a greater number of severe floods have occurred downstream than in the preceding 15 years. Due to a publicly expressed lack of confidence in the Army Corps of Engineers as well as any associated firms, engineering firm AECOM was selected to complete the study. URS, a firm closely tied to the Army Corps was denied the contract. No evidence was found that the dam at Pompton Lakes contributes to any flooding. 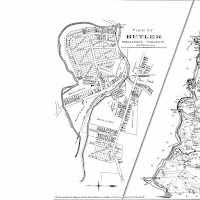 The dam at Pompton Lakes was found to alleviate flooding for Oakland, NJ. The lowering of the Pompton Lakes reservoir had no impact on the severity of flooding and the Pompton Lakes reservoir cannot be used for flood storage / mitigation. The release for the study of the Morris Canal feeder dams, the Pompton Dam & Pequannoc Spillway, in Wayne and Pequannock, NJ was pushed back to May for the draft and June for the final version. Frankly, that's a lot to digest. 157 pages of facts and figures to be specific. The conclusions themselves, too dense to be recounted in full here, are based upon analysis of years worth of storm data, flow models, hydrologic modeling, and unstable hydraulic modeling. In short, while the research data is good and the information is well presented, questions remain as to the methodology of the study as well as the interpretation of the findings. For example, the study found a significant increase in water pressure as a result of floodgate operations, however, this increase was found only within several hundred feet of the dam and thus not considered judged by the DEP to be problematic. Some listeners expressed outrage at that finding, asserting that the floodgates at least produce an increase in pressure over a longer distance and that this pressure increases the impact of flooding downstream. The DEP did respond to this, but only in a way which indicated a disagreement over interpretation of the data. Other members of the audience noted with frustration that the difficult questions posed to DEP members today are the same questions they face on a daily basis from local residents, many of whom have lost their homes. Concern was expressed that the audience members present were being asked to represent the validity of a study to the public whose results and methodology they did not fully endorse. Audience members were also displeased with the timetables presented by the DEP, noting that this study required near half a year to complete, that the DEP has provided no measures to drastically reduce flooding in the short term, and that the DEP has now announced a study to designate long term flood mitigation plans to pursue, but that the study results will not be available until roughly 2016. Concerns were also expressed that out of a 60 minute presentation to Mayors and Council of 6 months of data, only 10 minutes were allotted for questions. At the end of the day, the short version of 157 pages of what may well go down as one of the least popular reports issued this decade (even with 8 years to go), is the following: Nearly everything asserted by local towns to effect flooding in their communities has been denied by the DEP's study. Further, the DEP has attributed recent flooding to an "extremely wet decade" and provided no further cause for the issue. Suffice to say that those who were hoping for a flood solution from this study are likely to be disappointed. Saturday April 14th, Part 2 of this article series will appear, discussing in depth some of the solutions proposed by the DEP so far, in particular, buyouts. Part 3 will follow Monday April 16th.